Type 4X and IP66 rated enclosure. 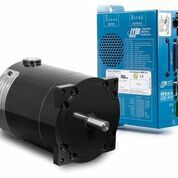 The HX56-100 Stepper Motor is specifically designed for use with the STAC6-Q-H Stepper Drive, the first and only step motor drive internationally certified for use in hazardous locations. The STAC6-Q-H features an advanced anti-resonance algorithm that ensures optimal torque performance from the HX56-100 over a wide speed range. Microstepping ensures smooth, high resolution positioning. The drive is capable of running stored programs created with Applied Motion’s Q programming language, and has sufficient input/output signals to connect to multiple external devices or sensors.